Now that the sun sets earlier and the air is cool and crisp, I want my home to have a warm and cozy vibe to it . I want my place to feel like a little cocoon of warmth and texture that I can relax in when the sun goes down. Doesn't that sound nice?! I love embracing the fact that the nights are long by switching my usually bright decor to a color scheme that is darker, heavier and reminiscent of the falling leaves. I just love how darker tones look at night when the home is illuminated by dimmed lamps and candlelight. Everything just melts together. How romantic... (rolling ma' eyes while I type this) sorry but Autumn gives me all the feels, yo! If you are an avid reader (love u!) then you've probably already read yesterday's post that tells where I got my inspiration from and my process for putting my ideas together and using a mood board, so I won't go through that again. If you haven't read the post, I recommend you check it out HERE. Bright cobalt, coral and palm leaves add a summer-vibe to my living room. Via "What's My Home Decor Style?" Obviously, I didn't go out and buy new furniture, but what I did do was switch out my "soft furnishings". What is soft furnishings, you ask? Soft furnishings are things like curtains, rugs and pillows and other things generally made of cloth that decorate a room. I think what made the biggest impact was changing up my rug to this luscious, hand-woven leather rug that I found for...wait for it... $85 bucks. For a 6x9. 👐 I must say, it was a little weird stepping on it at first because it's not very soft and you can feel the nubs a bit, But it gets softer and softer every day and now it's pretty comfortable. It's worth it if you ask me because 1. It's gorgeous 2. It smells AMAZING and 3. I'm assuming it's going to be pretty durable. I wanted to OD on texture because why not so I grabbed a pair of some fun fur poufs because they were SUPER cheap and I think they look so fashionable. I found them on clearance AND I had a coupon so I got them for less than retail. LIKE A LOT LESS. I'm talking $7 each, people! I can't even buy lunch at McDonalds for $7! 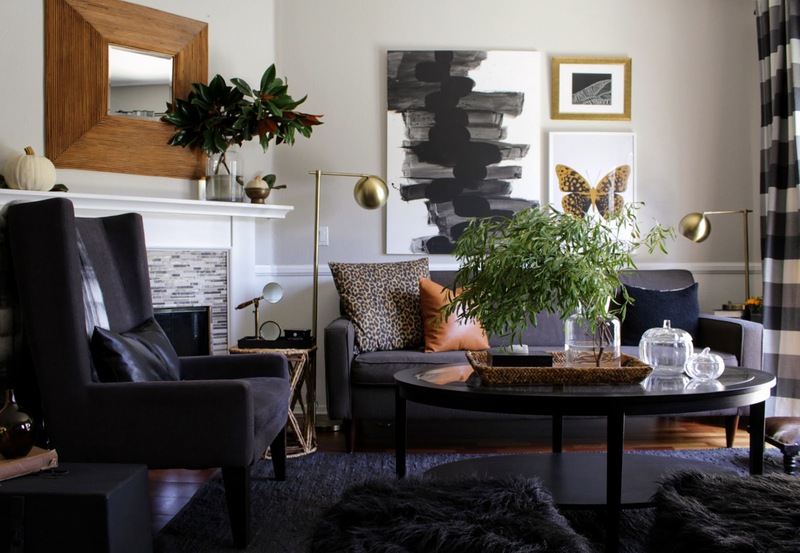 I also switched up my pillows to a leopard-print pillow and a faux leather pillow that brings in a warm, rust color to my living room. And of course, you know I like to add a bit of the outdoors to my spaces by bringing tree branches home with me during my walks around the neighborhood. I was picking up my kids from school when I came across our neighborhood gardeners clipping some trees and bushes. I asked if I could have some of their clippings and they were like "SURE, TAKE AS MANY AS YOU WANT!" My kids were mortified. Now, the clippings live on my coffee table. Speaking of nature and clippings, I also spotted a beautiful dried magnolia branch in the park and I took it home to make a centerpiece for my dining table! I love the colors of the dried leaves and I think they go well with my color scheme. I'M READY FOR PUMPKIN SPICE AND EVERYTHING NICE!!!! I've been looking forward to your tour and you didn't disappoint! It's just lovely. Such a good job editing. Every single thing adds something. Really beautiful changes. I am new to your blog and I really enjoy all that you share ans your friendly writing style. 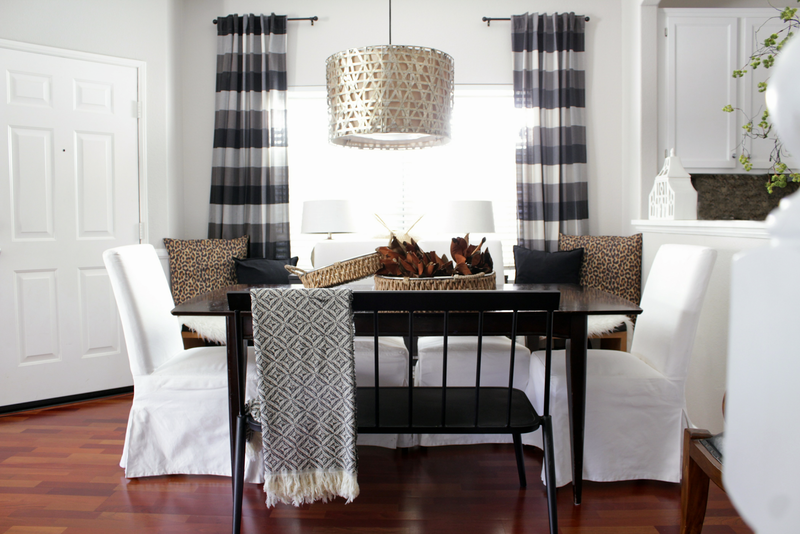 Now I am inspired to make a few simple changes at home to bring in the cooler weather! Hey,Darin! Welcome! thanks for stopping by and checking out the blog 😁 . I write like I speak because for me that's the most authentic way to communicate 😉 and plus it's the only way I know lol I hope you enjoy your fall decorating in your home! Oscar!!!!! This is fabulous! Adore your brown and metallic mix. 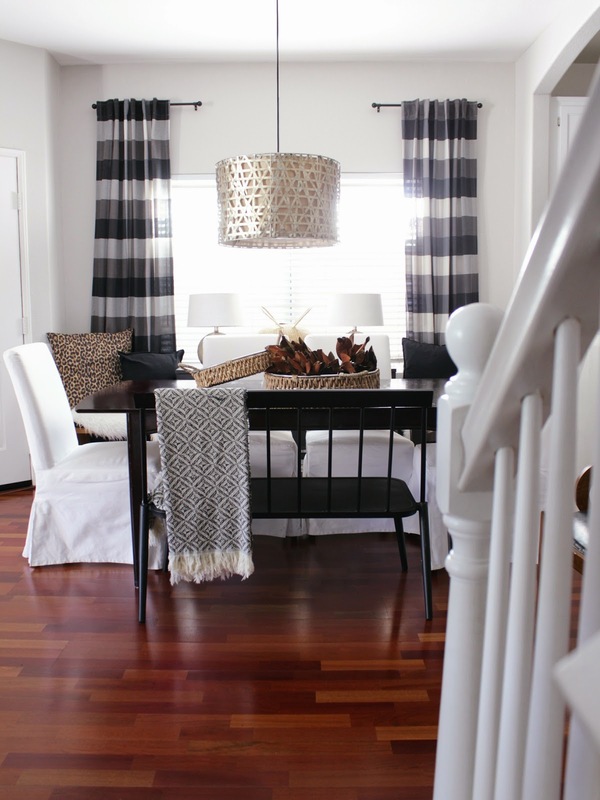 Your living and dining spaces are one point! I love this new look!! Def fall now! Only you could make dry leaves looks so good!!! Oscar, you are seriously a magician! It's like, Prest-o Change-o, and you end up with an amazingly designed space! Haha! Thanks so much Iris!! It's so refreshing to make changes here and there 😊. Thanks for checking out my post, my friend!